Is it too late to add something to my Christmas wish list? 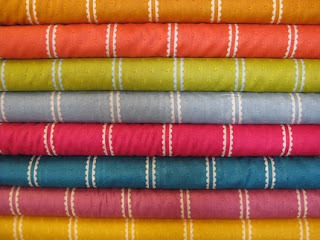 Here it is: these luscious Anna Maria Horner dobby voiles, called the Pastry Line. Doesn't that just make your mouth water? I mean, you can't eat candy canes 24/7, can you?? Santa, I have taken the whole economic stimulus program quite seriously, and have worked hard on the behalf of several very deserving online fabric stores, sending much of my money to them in order to make sure they stay in business. As such, I find myself in need of a, ahem....personal bailout. "Pastry Line" has arrived just in the St. Nick of time, this close to Christmas, but I know they won't last long. So I'm hoping perhaps you will find it in your heart to send your elves scurrying along to grab these up for me. Valentine's Day is just around the corner!!! !